No schedule is perfect. The Northern Pacific's North Coast Limited managed to fit in quite a lot: several hundred miles along the Mississippi River, the South Dakota Badlands (if the time of year was right and you woke up early enough), the climb up Bozeman Pass and through Bozeman Tunnel, the Butte Short Line's spectacular entry into Butte, Montana, and the gorgeous ride along the Flathead River to Paradise, with the beautiful ride along the Yakima River the next morning and the climb over Stampede Pass for a finale. But even with all that, passengers inevitably missed such sights as this stretch along the Clark Fork River and Lake Pend Oreille, hidden under cover of darkness. At Trestle Creek, Idaho (a little bit north of Hope), we see what the NCL's passengers missed. 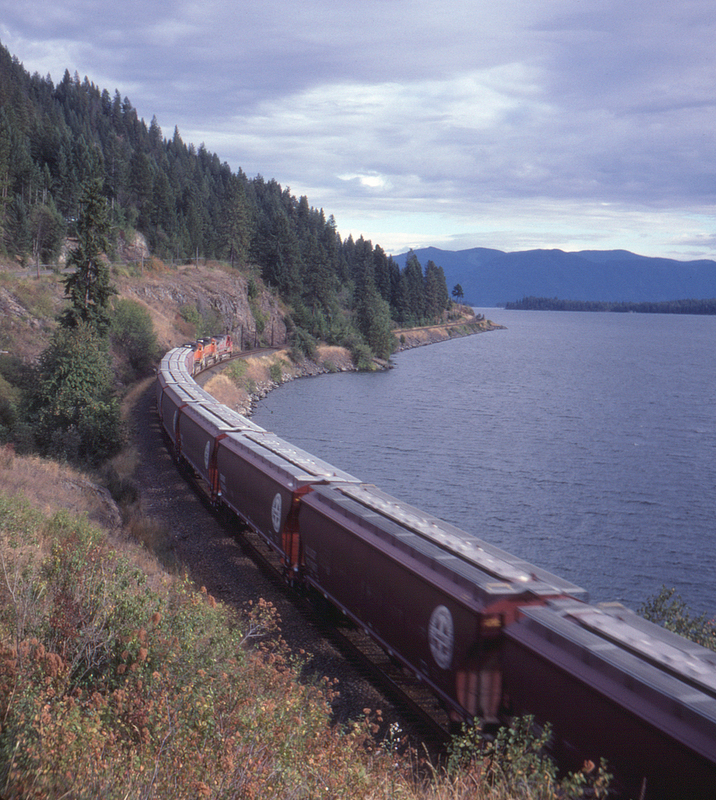 This is now Montana Rail Link trackage along Lake Pend Oreille, part of that "redundant" trackage that Burlington Northern thought it didn't need when it sold most of the Northern Pacific's Montana mainline to entrepreneur Dennis Washington. At least Burlington Northern (by now Burlington Northern Santa Fe) had the sense to build overhead running rights into the contract; here an eastbound BNSF freight skirts the lake on its way to Montana.